As someone who works on cars and has done countless home improvement projects, I feel I’m qualified to give my opinion on the two Central Pneumatic air compressors (also known as Harbor Freight air compressors) I own. First of all, don’t listen to those that say you need to spend a lot of money on a quality air compressor and that a cheap air compressor will simply break down in a month. Central Pneumatic simply makes good cheap tools. Sure, I could have spent hundreds more on similar sized Dewalt or Ingersoll Rand models, but why? My 3-gallon and 10-gallon Central Pneumatic air compressors are now going on 4 years strong and have always gotten the job done whether it be powering an air grinder when working on my ’68 Mustang to hooking up a nail gun to build our backyard shed. Even my wife uses the Central Pneumatic pancake air compressor to build picture frames. 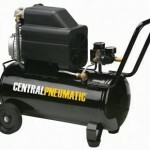 Here are short Central Pneumatic air compressor reviews on the two models I own. This is the workhorse out of the two. This 2.5 horsepower, 10 gallon air compressor has a direct drive induction motor with protection from thermal overload. I love its well-designed carrying handle and smooth rolling wheels. It makes it incredibly easy to move around. Like other air compressors, it’s important to keep it well oiled but never overfill. I’ve always been careful and have had no issues in almost 4 years. The Central Pneumatic 67708 builds a full tank of air in a very reasonable time and has plenty of power to run your air tools. It worked like a champ when framing the 12×8 shed we have in our backyard. The 67708 can get a bit noisy but most direct drive compressors are the same way. As long as you keep it properly oiled, the Central Pneumatic 67708 is one of the best air compressors for everyday use around your house. Check out the video below to see it in action. The Central Pneumatic 95275 is a fantastic little portable air compressor. The oilless design makes this an extremely low maintenance compressor. Because of its “pancake” low-profile shape, it’s very portable and perfect for small projects inside the house. Don’t let the size fool you though as 100 PSI is still enough to run most air tools. I wouldn’t attempt framing a house with this but it’s great for inflating tires, blowing out gutters, crafts projects, or trim work around windows. The 95275 gets to 90-100 PSI quickly and it has a very low leak rate so it’s not always cycling off and on while not in use. Overall, this little Central Pneumatic air compressor is a great value and powerful enough for many of small but common projects around the house. No garage should be without an air compressor and this compressor makes for one of the best housewarming gifts you can give. My particular air compressors were purchased through the Harbor Freight Tools website although they have local stores in some areas. From time to time, Amazon carries a few of the most popular Central Pneumatic air compressor models and sometimes at lower prices that at Harbor Freight. Various Central Pneumatic parts are also readily available from a variety of online stores. Wherever you buy from, Central Pneumatic air compressors are covered by a 90-day warranty. 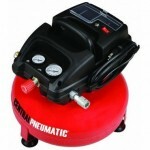 I have a Central pneumatic 2.5 HP 21 Gal 125psi. You turn it on sometimes it fires right up then other times u have to hit reset several times to get it to come on. But it only builds up to 5lbs. Air pressure then cuts right back off. Any suggestions to my problem. Central pneumatic 95275 lasted 1 year. I used it maybe 3 times , stored it it indoors. and now it does not pump over 20 psi. I emailed Central pneumatic looking for replacement parts, and have none. I was thinking about buying a CN. # 95275 pancake style air compressor until I read the comment that ” JOHN ” stated about this unit . I think the comment speaks for itself . Does CN. 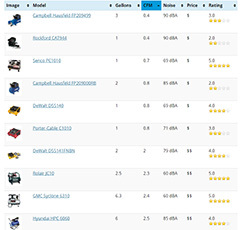 backs it’s products OR any replacement parts ? Why buy anything if you can’t a replacement unit or parts ?